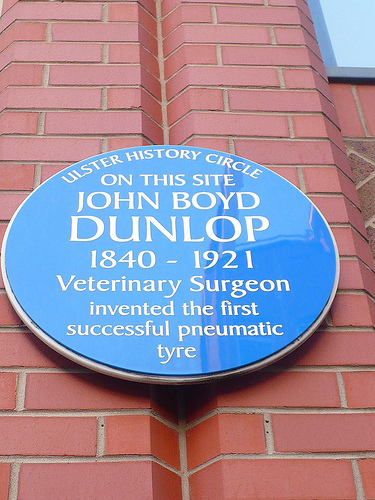 Dunlop (1840 to 1921) was born in Ayrshire, Scotland and qualified as a veterinary surgeon before moving to Belfast in 1867. His practice was at 50 Gloucester Street, Belfast, Ireland. His great invention, of the inner tube for cycle tyres, came about more or less by chance. In 1888 his small son was prescribed cycling as cure for a heavy cold; Dunlop hit on the idea of making the boy's tricycle more comfortable by fitting it with inflated tubes, made of canvas and bonded together with liquid rubber. He patented this idea on 7 December 1888, using the word 'pneumatic' for the first time [See below] , in the same year. A local firm, W. Edlin and Co, then agreed to manufacture frames to fit the new tyre; and when, in 1889, a well-known local cyclist, Willie Hume, won a race at Cherryvale using it, the novelty started to catch on. The paper manufacturer, Harvey du Cros, who was in the crowd at the time, bought Dunlop's patents in 1896 for £3000. Dunlop had in the meantime moved to Dublin, where he manufactured bicycle frames in collaboration with a local firm, Bowden and Gillies. 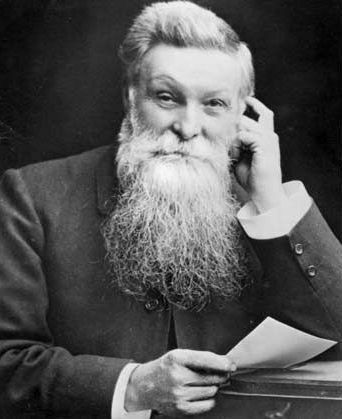 He died on 24th October 1921. This was not the first time someone had tried making inflatable tyres. 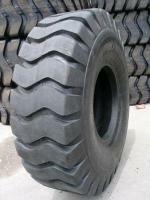 Another Scot, Robert William Thomson had patented the idea in 1846 (Dunlop was unaware of this patent).